Cranberry Orange Bread Pudding is a simple, classic dessert all dressed up with fresh cranberries and a hint of orange for the holidays! 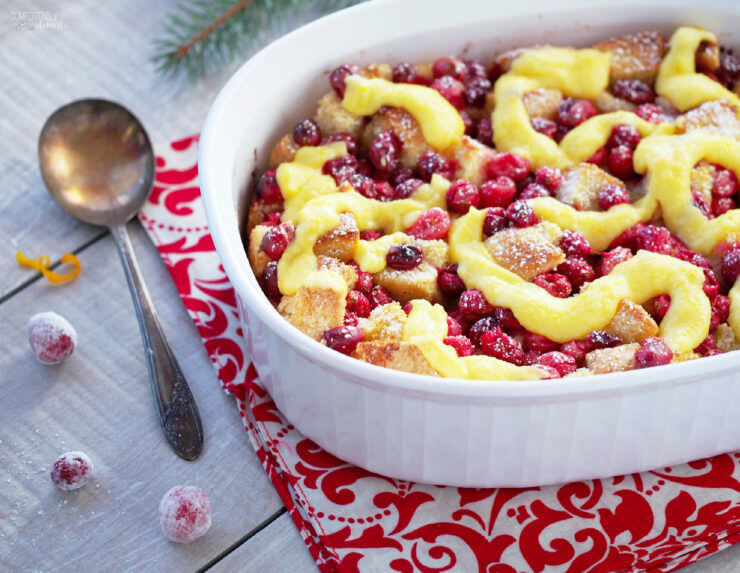 Topped with a simple orange custard sauce, Cranberry Orange Bread Pudding is proof that leftover bread can easily be transformed into a delicious dessert. This post is sponsored by Milk Means More. All opinions are my own. Can you believe that today is the First Day of Christmas? As in, there are only 12 more days until Christmas? Yeah…I’m having a hard time wrapping my head around that one, too. How it got to be the middle of December, I may never know. All I know is that I’m not in the Christmas spirit until we’ve had a good snowfall, I’ve watched Elf at least once, and binge-watched approximately 47 Hallmark Christmas movies. We were gifted with more than a foot of fluffy lake effect snow over the weekend. Check! We watched Elf for the first time of the season on Friday night. Check! I’ve been on a Hallmark Christmas movies bender since before Thanksgiving. Check! Now I’m full on ready to spread Christmas Cheer by singing loud for all to hear! Be thankful that this post doesn’t have audio, Friends. I’m ready. Bring on the holiday season! Let’s just ignore the tiny fact that I just began shopping last week. I have to know…are you an early Christmas shopper or a last minute kind of person? Me? I fall somewhere in the middle. I write down gift ideas all year long, but I save the shopping for December. The mere thought of cutting it this close to the wire makes my BFF Jeanne break out in hives. That girl puts a capital “O” on the word Organization. We all need a friend like Jeanne. Now, my Bacon Slayer is content to do his shopping on Christmas Eve. The thought of that makes me want to break out into hives! I shopped with him one year on Christmas Eve–on the way to his family’s Christmas party–and I swore to take the reins from there. I’ve been doing our shopping ever since. But as for the food? Y’all have got to know that I’ve been planning the menus for the Christmas season for months now! Christmas Eve dinner is always a nod to my in-laws with Christmas Eve Lasagna. For Christmas dinner, I channel my Danish ancestors by roasting an easy fruit stuffed pork loin. I also whip up quick pan seared Brussels sprouts with bacon because every holiday meal should have two forms of pork on the table, amiright? I round out the meal with fat, buttered slices of the braided cardamom bread that my grandma loved so dearly. Every bite of that bread makes me feel like my gram is still with me. Gram and my late aunt Jane are also the reason that I will always serve spiced Pfeffernusse snowball cookies for dessert around the holidays. My boys enjoy all of the foods of Christmas, but I swear that they would declare mutiny if I didn’t serve some form of baked french toast casserole for breakfast on Christmas morning. This year, I’m going to do them one better and serve dessert for breakfast! For as much as I love pie for breakfast and have passed that down to my kids, I do love a good bread pudding every now and again. 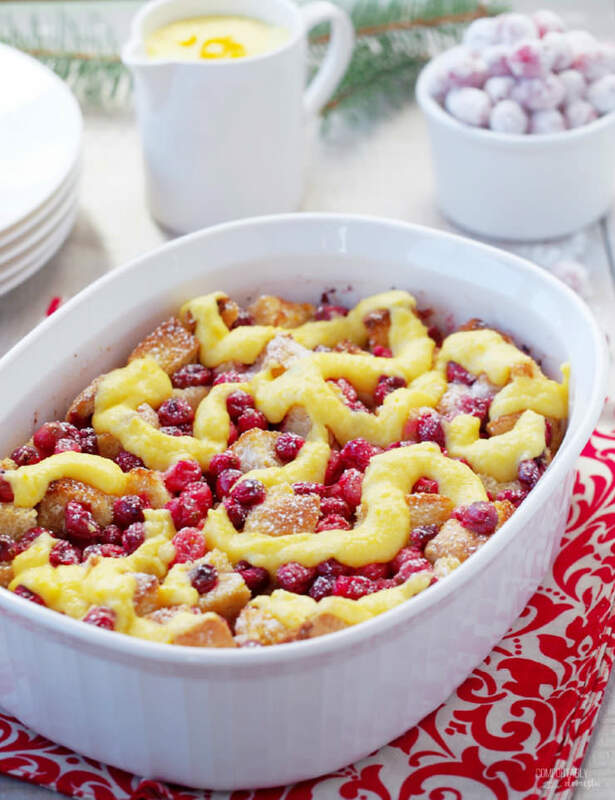 Cranberry Orange Bread Pudding is a simple, classic all dressed up for Christmas with fresh cranberries and a hint of orange. Topped with an easy orange custard sauce, Cranberry Orange Bread Pudding has all of the flavors and warmth of the season baked inside. Serve this to your family, and I just know that they’ll taste the love of the holidays in every bite. 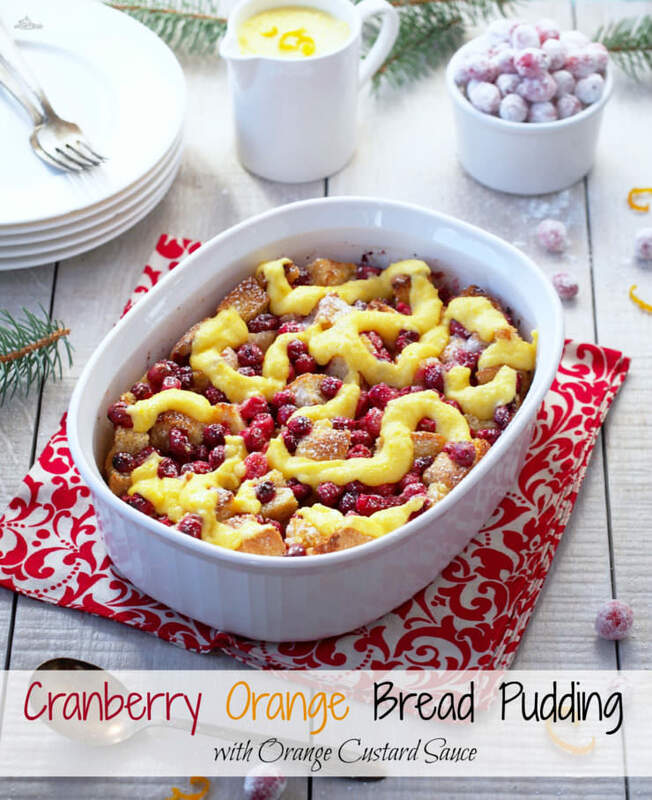 Cranberry Orange Bread Pudding makes a festive dessert or indulgent breakfast! To prepare the pudding, cut the bread into bite-sized cubes. If the bread is soft and fresh, place the cubes onto a half sheet pan and let it stand at room temperature overnight to dry out before proceeding with the recipe. If using day old bread, proceed immediately with the rest of the recipe. Preheat the oven to 375 degrees F. Smear a teaspoon or two of softened butter around the interior of a 13x9x2 baking dish . Place the bread cubes into prepared baking pan. Scatter the fresh cranberries over the bread. Beat the eggs with the sugar, milk, orange juice, orange zest, melted butter, vanilla, and cinnamon until well blended. Pour evenly over the bread and cranberries to coat. Sprinkle with the coarse sugar, if desired. Bake for 60 to 65 minutes or until the custard is set and the edges of the bread are browned. While the bread pudding is baking, prepare the custard sauce by whisking the egg yolks together with the sugar in a small saucepan until it has lightened to a pale yellow color; about 2 minutes. Stir the half & half into the mixture until combined. Cook over low heat, stirring constantly, for 15 to 20 minutes or until the sauce thickens enough to coat a spoon (160 degrees F). Stir the orange zest into the custard sauce. 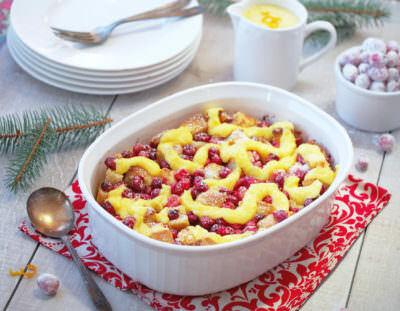 Serve Cranberry Orange Bread Pudding with warm custard sauce over top. I always overbuy for Christmas. Every year I tell myself I'll be on a budget and just get X number of items, but I always see more and more awesome things for my friends and family. Ugh! 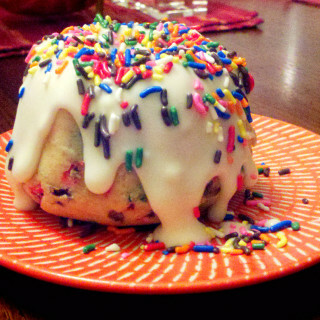 Anyway, this breakfast ideas look so tasty! The pan you have pictured with the pudding does not look like a 13x9 pan. It looks like my French White Corning Ware casserole that holds 2 1/2 quarts. I a wondering, because if it is the same size (volume wise) I would rather use the Corning Ware. It looks prettier. Good eye, Deanne! ? The recipe is written for a 13 x 9 pan because it is more common. I like to use my 2.8L oval French White CorningWare because it is prettier. --The 2.8L oval It's also deeper than the 13x9, so I extend the baking time by about 5 minutes to compensate for the depth & difference in exposed surface area. I have not tested this recipe in my 2.5L round French White CorningWare. This would make the most amazing Christmas dish! The colors are just perfect and scream Christmas Day and Christmas Eve to me! Also, I have not really watched any Christmas movies this year and that makes me super sad! I LOVE that you have an addiction to Christmas movies. Mostly because I share that addiction. I swear I've watched every single one this year. And Elf is a must. I've watched it twice. Once while B was here so we could decorate the tree. Then again the other day all my myself. It's sad. But it's such a funny movie. Did you find The Mistletones yet this year? I wish we lived closer so we could binge watch Christmas movies together. This recipe is amazing. I love bread pudding and citrus is always one of my favourite things to eat during the holidays. It just brightens up the holidays. Plus it goes so well with cranberries. That looks absolutely terrific and that orange custard sauce is just the perfect touch! I should write down gift ideas all year long because come Christmas, I'm pulling blanks! 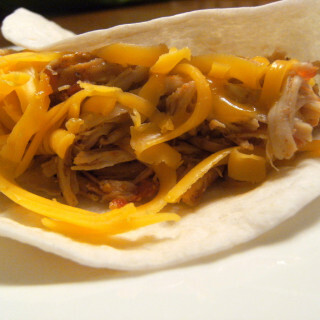 Great idea :) And this recipe looks fantastic! I'm not sure I ever had bread pudding (ya know, didn't grow up in this country) but now I definitely want to try it out!